Have you ever wondered how to import your firearm to Africa? Do you know how many firearms you are allowed to take? What about ammunition? What inoculations are recommended for what country? Have you researched the hunting blocks in the countries you want to visit on your next safari? What animals can be legally hunted in each country? Do you know what the official trophy fees are in Zambia? What are the caliber restrictions for shooting a lion in Tanzania? Do you know that Cameroon has three official languages? Do you know which big-game animals are protected in Botswana? If your lack of knowledge has held you back from taking an African safari, the Safari Guide 2007–2008 is the answer. A detailed step-by-step “What to expect” essay for each country that takes you from your flight to Africa, through customs, to the safari hunting area, and back to the airport. It also gives information on exporting trophies. This section is very detailed and really valuable. Detailed country map and information on visas, money, banking, country facts, and languages. Harvest results and trophy sizes. Essays on how to oversea trophy field care; tipping on safari, what to expect on your safari, evaluation of emergency evacuation services and what else to read before your safari. Safari Guide includes hundreds of photos, maps of countries and hunting blocs, checklists of the animals that occur in each country, checklists of the animals on license, background information, currencies, languages spoken, health and travel advisories, visas, and much more. The hard-hitting, useful information found in this guide will help you, the hunter, understand the bewildering number of rules, regulations, and customs of each country so that you can properly plan and enjoy your safari to the fullest. 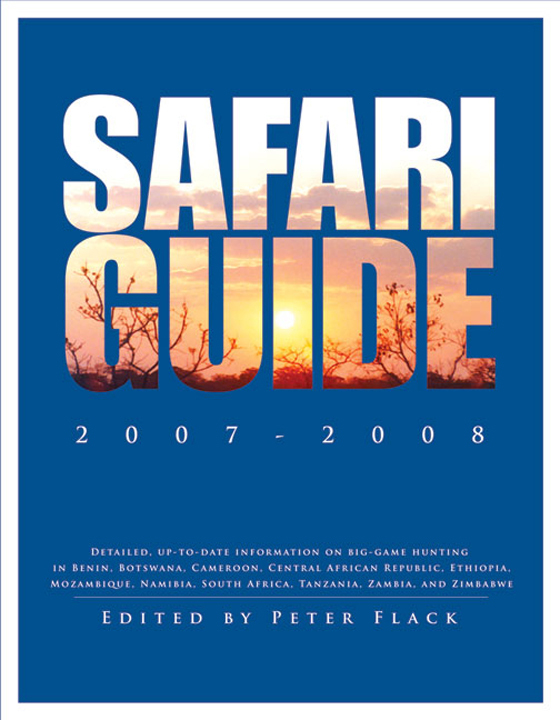 Be an informed Dark Continent hunter and purchase the Safari Guide 2007–2008 BEFORE you purchase your next safari. It will save you thousands of dollars and make your next big-game hunting safari in Africa your most enjoyable adventure yet. More than a dozen contributors—including Jack Atcheson Jr., Craig Boddington, Fred Duckworth, Peter Flack, Jack Jonas, Debbie Peake, Jason Roussos, Diana Rupp, and others—have made this the most up-to-date guide available today. Submit your review for "Safari Guide 2007-2008 (Sc)"